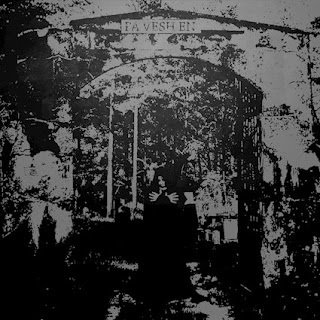 This is a review of a split album between Belarus's Pa Vesh En and United Kingdom's Temple Moon which will be released in August by Iron Bonehead Productions and we will start off the review with Pa Vesh En a band that has recently had music reviewed in this zine and plays a very raw form of black metal. Their side of the split starts out with dark soundscapes and heavy riffing before going into a very fast and raw musical direction which also uses a great amount of tremolo picking and blast beats while the vocals bring in a mixture of high pitched depressive black metal screams and bestial growls which are kind of mixed down low in the mix. Throughout their side of the recording you can also hear a great mixture of slow, mid paced and fast parts while the riffs also bring in a decent amount of dark sounding melodies at times along with a small amount of guitar leads as well a s a brief use of ambient elements and on the closing track spoken word parts are added into this music, the production sounds very dark and raw while the lyrics cover darkness, night and occultism themes. In my opinion this is another great sounding recording from Pa Vesh En and if you are a fan of raw ambient black metal, you should check out their side of the split. RECOMMENDED TRACKS INCLUDE "The Murder Instinct" and "Damnation And The Witch". Next up is Temple Moon a solo project that plays an old school form of black metal. His side of the split starts out with a very fast and raw sound which also utilizes a great amount of tremolo picking and blast beats while the vocals are mostly high pitched black metal screams along with the music being very heavily rooted in the 90's and the songs also bring in a great mixture of slow, mid paced and fast parts. Melodies can also be heard in some of the guitar riffing while the music also captures a depressive atmosphere at times along with the music sounding like it could of easily been recorded and released 25 years ago and there is also a brief use of atmospheric sounding synths and clean playing, the production sounds very dark, raw and old school while the lyrics cover nature themes. In my opinion Temple Moon are a very great sounding raw and old school black metal solo project and if you are a fan of this musical genre, you should check out his side of the split. RECOMMENDED TRACKS INCLUDE "Ceremonial Decay" and "VI". In conclusion I feel this is a very great sounding split and I would recommend it to all fans of raw black metal. 8 out of 10.